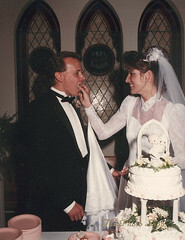 Twenty years ago, at 6:00 p.m. central standard time at a little church in Nixa, Missouri, Kevin and I got married. Even though we were not members of the church, we picked the church because a coworker of mine suggested it; I found it attractive, easily accessible and fell in love with the lovely stained-glass windows behind the pulpit. We had a very modest, but beautiful wedding. Even if we could have afforded a big fancy wedding, neither one of us wasn’t interested in having a big fancy wedding. Getting there wasn’t that important to us, being man and wife was all we cared about. I can honestly say, I have married the ONLY man on planet Earth who could have possibly put up with me for any length of time. (Contrary to popular belief, I’m not the easiest person to get along with. *cough*) Kevin knows when to be quiet and let me vent, he knows when to inject humor to diffuse my temper. He knows when to be strong for me and when to step back and allow me to handle things. He is, quite simply, my soul mate. Our life has never been a fairy tale. We’ve had our fair shares of ups and downs. There was a time period, around our seventh year of marriage, that I was quite convinced we would not make it. In fact, I went so far as to actually shop around for divorce attorneys, but somehow, we had the maturity and the presence of mind to pawn the kids off on family one night and air our grievances. We were honest with one another, brutally honest with one another, and we said what was on our minds. And we both tried very hard to take everything said to heart and to change our behaviors and work at improving our relationship. It’s true, you know. Surviving hard times really DOES make your marriage stronger. We’re pretty strong right now. And I don’t see our bond weakening any time soon. We’ve gotten comfortable with each other. We’ve taken advantage of each other. We’ve settled. And though there have been times when our relationship has been “comfortable” (okay fine, boring), it’s been a comfortable peace. 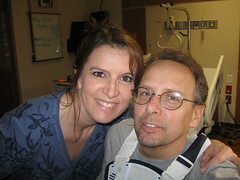 We’ve started a new chapter in our married life: Kevin is now in a wheelchair. It’s not permanent, he will walk again at some point (we’re thinking around August), but it’s been a HUGE adjustment for us both. Not just physically, but emotionally. Now, suddenly, our roles have been reversed. Kevin has always been my provider, the person who has taken care of me, now it’s the other way around. He completely relies on me for everything. From getting him out of bed, to making sure he has something to eat, to helping him with his personal hygiene. And I honest-to-God don’t mind. In fact, I’m grateful – I’m grateful he’s alive and breathing because due to the nature of his accident, he probably shouldn’t be here with us today. And it’s because God was watching out for him that day. I had no idea it was even possible to love another human being more than I do my husband. He’s so much a part of me now, I can’t imagine my life without him and I thank God that I don’t have to. This accident may be a speed bump in our marital journey, but we refuse to allow it to slow us down. We will continue to live, we will find our new normal, we will heal and we will persevere. … and we have each other.